WordPress is a free and open source platform that offers you ability to create your own website very quickly. This is one of the reasons why it is the number one choice for many people looking to start their own website, albeit for purposes as a personal blog or a way to start marketing a small business. Bootstrap is a sleek and easy way to use in development on any website, including WordPress. It offers a huge range of powerful tools that can make big design improvements. If you have a WordPress website that you want to improve by offering an interaction with a customer without distracting them away to a different part of the website, adding a Bootstrap Modal might be the option that you are looking for. The modal can be fully customised according to what you are trying to achieve. You can simply add information for the viewer to read or it can be made more purposeful and add something like a contact form inside the modal. This is a neat way to interact with your website viewer in order to receive information from them. Modals can take the clutter away from the front-end of your website. Firstly navigate to your website's public WordPress files and connect via FTP. Your web hosting provider should know the details that you need to use. 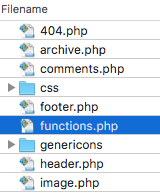 Enter the public_html folder and then proceed into the the 'wp-content' folder, which holds the majority of the website files. Next head into the 'themes' folder. 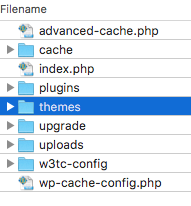 Inside the themes directory, you may notice that there are a number of default themes that WordPress has pre-installed or there could be themes that you've installed yourself. If you're unsure what theme your WordPress website is using, log into your WordPress admin panel and head into the 'Appearance' -> 'Themes' section. You should see the list of themes and a label across the one that is 'Active'. Open the theme folder that your WordPress website is using. You should now see all of the your WordPress website files. You can add by two ways; you can either include the file from a remote location by specifying that remote URL or you can put the file locally inside your theme folder and specify that local URL. To download the file for your local, save this link . Note that you don't need to create this function - you are looking for the existing function to add either one of the below inclusions to. Please note - if you have placed your bootstrap-modal.min.js file in a different location, the path in the code example will need to be amended. Our example has it placed inside the WordPress theme directory in the 'assets/js' folder. Please note - it is now recommended to check that your website still loads as expected. If there's any signs of a syntax error, please check the file that you have just edited for errors such as any stray characters or missing semi-colons. 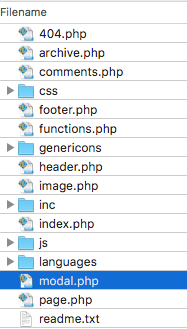 Inside your theme folder, create a new file and name it 'modal.php'. Open the newly created modal.php file in your editor so you can add HTML code to it. You should now save the file changes. This code is an adapted version of what Bootstrap provides which is used to show the modal that will appear in the centre of the screen. This includes the container class which has been intentionally given an id of 'bootstrapModal' which will be used later. Inside the container is the modal header that shows the modal title, the modal body which contains a text line example, and finally the modal footer which offers a button which can be used to close the modal. Now that the new modal.php file has been created which contains the modal HTML markup code, this now needs to be included to your WordPress website so the website knows what to show when the modal is triggered. In order to allow the modal to be triggered anywhere on the website, the best place to add this to is the footer section of the website, which is stored in the 'footer.php file. 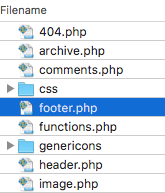 Open your WordPress theme's footer.php file in your preferred editor programme in order to modify it. You can now save the file. This code now references the new modal.php file that was created. Earlier it was explained that when the modal code was added to the modal.php file, an intentional id was given to the markup. This will now be used to trigger the modal to open when interacted with. Add the following code to any part of your WordPress website. It's important to note that this is HTML markup. It can't be added as plain text. This article has helped explain how to add a Bootstrap Modal to a WordPress website. By following these steps, any user with experience of editing and creating files can do this with confidence. A simple version of a modal was demonstrated but by improving this to something more adaptive to your website can make a significant user interface improvement.